New emerging housing models are challenging property developers and financiers to completely rethink the current real estate paradigm. The rising demand is for affordable homes, greater connection, shared spaces and community. Think of it as a new style commune. The word “commune” conjures up images of hippies, dreadlocks, drop outs, idealism and religious camps, and on the extreme end of the spectrum, cults. In Australia, it started with the rush of idealistic commune settlements that were spawned following the Aquarius festival held in Nimbin in 1973, and the growing sense of a “movement” that followed. This model of living was predominantly rural, anti-establishment, anti-commercial and favoured by those who wanted to live outside of mainstream society. Recently the concept of “commune” and shared living has resurfaced it a new form: this time it’s more urban/inner urban – although there will be rural versions – with a mix of private and public spaces, driven among other things by young and not so young people who want to remain in cities, close to their jobs and all that cities offer, who currently cannot afford to own their own homes. Think The Nightingale and 122 Roseneath Street in Melbourne, and the long and growing waiting lists attached to new projects like them. These models address some aspects of community and small footprint living, and have been very well received; however, while they have taken measures to reduce construction costs, and in effect reduce the price of dwellings, they are by no means accessible to all. Factors driving The New Commune include the well canvassed current crisis in housing affordability, so that even young couples with two good incomes cannot ever hope to own a home, an aging population that wants to age in place and remain connected to people of all ages, a sharp rise in the number of people suffering from loneliness and social isolation, awareness that we need to make better and more dense cities, an increasingly mobile population that loves to travel and wishes to plug into an instant community on arrival, the growing hunger for sustainable ways of living and better use of resources, and a widespread desire to share and engage. Plus, the demonstrable economic value built by the shared economy business models: AirBnB, GoGet, Base.Life and Airtasker, among others. Humanitas, Amsterdam, where college students and nursing home residents live together. In sharp contrast to these highly successful new resource sharing models, our contemporary real estate paradigm is driven solely by return on shareholder investment. Clearly, the property development industry needs to think differently about designing, funding and creating housing in Australia, or risk missing the boat. By contrast, The New Commune is about building community. It’s about the establishment and nurturing of resilient local economies, where the concept of sharing is every day – driven by the desire to live a more simple, sustainable life in community. It is about putting humans and human interaction at the centre of residential architecture, as opposed to investment potential, as is currently the case. The change must be more fundamental than the current lip service paid by the real estate industry to mock “shared living”, in the form of token rooftop gardens, designed to make a development appear more green and “sustainable” in the glossy real estate brochure. Today’s New Commune is no longer about people on the fringes of society – it’s mainstream, it’s here, and some of our most astute and forward thinking young professionals are driving the change. The New Commune is no longer an idea ahead of its time: its time is now, and the demand is there. The challenge for the property development industry is to completely rethink the way some projects are conceived, designed and funded, to meet this clear and growing market demand for this type of housing. For more than 100 years the average Australian family was able to buy its first home on one wage. The median house price was around three times the median income, allowing young home buyers easy entry into the housing market. Relative to incomes, between 1900 and 2000 the median house price has increased by more than 300 per cent; house prices have increased from three times median incomes to more than nine times median income. Over 5600 secondary dwellings now exist in Australia; 20 per cent more granny flats were approved in 2014-2015 – 240 per cent more than in 2009. Architects are increasingly being asked to design homes to accommodate two or more generations of the same family, which build in the flexibility for homes to adapt as both children and parents grow older; in other words generationally adaptive houses. This is akin to the multigenerational housing model that has successfully existed in most societies around the world – Europe, China, SE Asia and the Middle East – until the mortgage led/single family housing model emerged mid 20th century in Australia, the US and most western societies, driven by banks. In the 20-year period to 2015, the percentage of the population living to 85-plus increased by over 150 per cent. In just one generation, we will see the percentage of people over the age of 65 go from 14 per cent to over 20 per cent. As they get older, people don’t want to leave the family home. Only six per cent of the senior population opts for a retirement living option. Even fewer, about five per cent, must choose assisted living or full care. Today there are 4000 people over the age of 100 in Australia. In 2056, the Intergenerational Report posits that there could be over 40,000. It’s a given that the Baby Boomers have disrupted the thinking and assumptions that have driven the development of the built environment that Australia has, until now, provided for its seniors. But what is also assured is that this group has no desire to become removed from active engagement with the communities in which they live as workers, mentors and seniors. In Britain alone, there are 7.6 million single person homes. The biggest cause? We now live longer. NOTE: Statistics and facts above are drawn from the 12th Annual Demographia International Housing Affordability Survey 2016, Niche Media’s Architecture & Design Forecast 2016 and BBC’S Age of Loneliness Film. 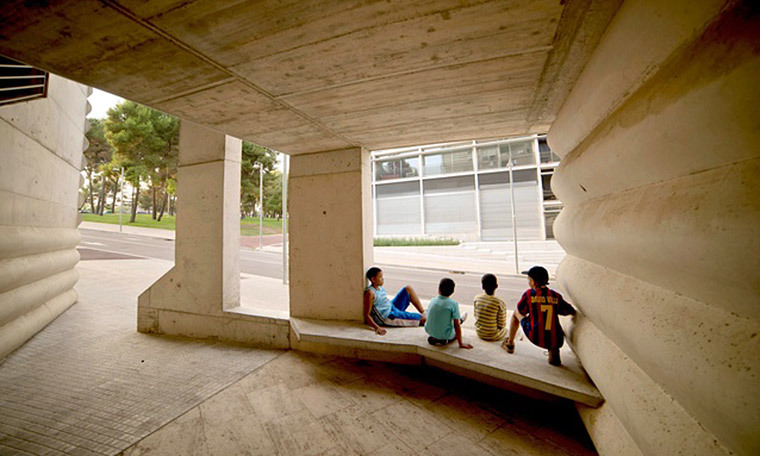 Edificio 111 by Barcelona-based Flores Prats Architects focuses on community spaces. This concept of the “commune” or communal living extends to the shared design and making of place. As distinct to commercially driven lip service given to community and sustainability in developer driven models, it is a conscious choice based on a shared vision. It means enjoying all the givens of traditional home ownership with the addition of shared facilities and amenities. Irrespective of context, the key elements are the same: opportunities for community interaction paired with private space. As prefaced earlier, housing affordability has a key role to play in the rise of interest in shared living/co-investment housing models. We need to re-write the definition of affordable housing. In this generation, people with perfectly good salaries cannot dream of owning a home. The industry also needs to rethink the way we design, develop and build projects. Good design can and should be part of every project, accessible to all, not simply a consumable available to the rich and well resourced. For too long the market has been driven by the developer, not the consumer – as designers we rarely get to meet or speak to the eventual users, even when we are designing low-cost public housing. To meet the specific needs of each and every individual who will use the space, its future inhabitants must form an integral part of the decision-making process and be given forums/opportunities to inform the design process. This is even more poignant in the case of establishing an “intentional community” where the thresholds between private and public spaces must be artfully considered and articulated. 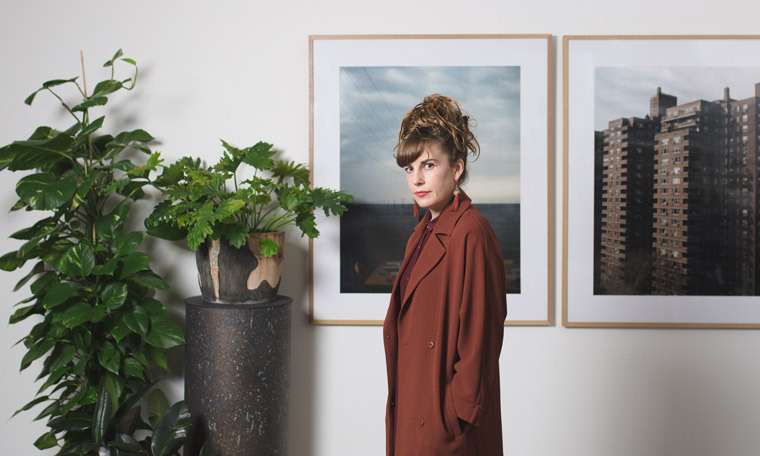 Katy Svalbe is co-founder and co-director of Sydney-based landscape and interior architecture practice Amber Road. Really interesting article and I think spot on. Well done Katy. We really do need to rethink real estate and how it works with our communities in the current day. Bearing in mind, as noted in the article, that the future is here! Yes, a great article. With an ageing population it is alluding to the need for regulation to get the principles of universal design (design for everyone) into standards and codes so that local government can push it with developers. The voluntary Livable Housing Design Guidelines promised by Livable Housing Australia to be gradually rolled out to 100% by 2020 is not, and will not, happen until there is code regulation – voluntary cannot work in the house building industry – regulations are the glue that holds it together. What an excellent article. We have the same problems re high house prices in many areas of South Africa. Young professional couples with two good incomes cannot buy a house or even a two/three bedroomed flat/apartment. I really like you analysis and description of the Commune model. It is related to New Urbanism? A more affordabe variation? Yes, the property developers have to wake up. They actually also have to look after themselves! Their model is getting outdated!